Thousands of miles of buried fiber optic cable in densely populated coastal regions of the United States may soon be inundated by rising seas, according to a new study by researchers at the University of Wisconsin-Madison and the University of Oregon. 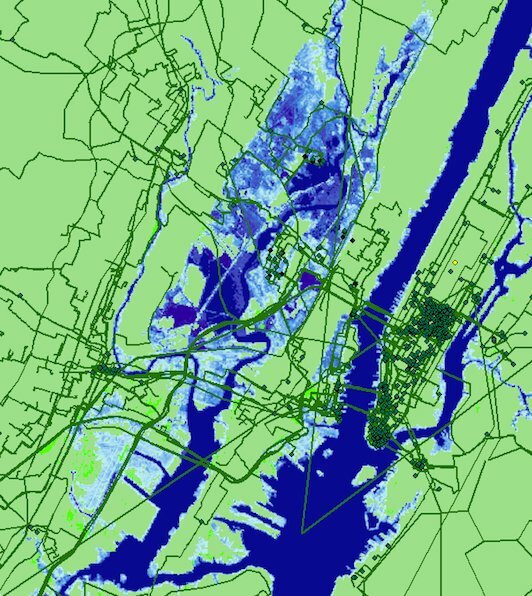 The study, presented here today (July 16, 2018) at a meeting of internet network researchers, portrays critical communications infrastructure that could be submerged by rising seas in as soon as 15 years, according to the study's senior author, Paul Barford, a UW-Madison professor of computer science. "Most of the damage that's going to be done in the next 100 years will be done sooner than later," says Barford, an authority on the "physical internet"—the buried fiber optic cables, data centers, traffic exchanges and termination points that are the nerve centers, arteries and hubs of the vast global information network. "That surprised us. The expectation was that we'd have 50 years to plan for it. We don't have 50 years." The study, conducted with Barford's former student Ramakrishnan Durairajan, now of the University of Oregon, and Carol Barford, who directs UW-Madison's Center for Sustainability and the Global Environment, is the first assessment of risk of climate change to the internet. It suggests that by the year 2033 more than 4,000 miles of buried fiber optic conduit will be underwater and more than 1,100 traffic hubs will be surrounded by water. The most susceptible U.S. cities, according to the report, are New York, Miami and Seattle, but the effects would not be confined to those areas and would ripple across the internet, says Barford, potentially disrupting global communications. The peer-reviewed study combined data from the Internet Atlas, a comprehensive global map of the internet's physical structure, and projections of sea level incursion from the National Oceanic and Atmospheric Administration (NOAA). The study, which only evaluated risk to infrastructure in the United States, was shared today with academic and industry researchers at the Applied Networking Research Workshop, a meeting of the Association for Computing Machinery, the Internet Society and the Institute of Electrical and Electronics Engineers. Much of this infrastructure is buried and follows long-established rights of way, typically paralleling highways and coastlines, says Barford. "When it was built 20-25 years ago, no thought was given to climate change." Risk to the physical internet, says Barford, is coupled to the large population centers that exist on the coasts, which also tend to be the same places where the transoceanic marine cables that underpin global communication networks come ashore. "The landing points are all going to be underwater in a short period of time," he notes. The impact of mitigation such as sea walls, according to the study, are difficult to predict. "The first instinct will be to harden the infrastructure," Barford says. "But keeping the sea at bay is hard. We can probably buy a little time, but in the long run it's just not going to be effective." In addition to looking at the risk to local and long-haul infrastructure in the nation's coastal areas, the study examined the risk to the buried assets of individual internet service providers. It found the networks of CenturyLink, Inteliquent and AT&T to be at highest risk. The findings of the study, argues the Wisconsin computer scientist, serve notice to industry and government. "This is a wake-up call. We need to be thinking about how to address this issue."